With superb world-building that includes the real world, the faery world, and a dystopic future, this hauntingly astonishing adventure is the start of a new trilogy from the master of the sci-fi/fantasy genre, Catherine Fisher. Fans of Orson Scott Card, Shakespeare, Grimm, and Blade Runner won’t be disappointed. Why did I read this book: I am a big fan of Catherine Fisher’s writing – I loved Incarceron and Sapphique, and also enjoyed her Relic Master series (originally published years ago in Australia and the UK, but only recently repackaged and released in the USA). When I learned Fisher had a new series in the works, I was thrilled. Jake Wilde is an angry young man. Following his father’s mysterious disappearance years earlier, Jake’s life is thrown into a tailspin. Abandoned by his mother, Jake’s new guardian is Oberon Venn – the enormously wealthy reclusive scientist, who immediately sends Jake away to a prestigious and expensive boarding school in Switzerland. While Jake has never met Venn, he knows beyond any doubt that Venn is behind his father’s disappearance: Jake knows that Venn killed his father, and vows to have his revenge. When Jake is expelled from school (all according to plan, of course), he heads to Venn’s isolated woodside estate, escorted by one of his former teachers. It is here that he comes face to face with his mysterious guardian for the first time, and learns that there is much, much more to his father’s story, and to Venn’s. Here, Jake also meets Sarah – an escaped patient from a nearby mental institution, masquerading as the niece of Venn’s manservant Piers – who has a singular mission of her own. Pitted against Jake, Sarah, and Venn, however are significant, frightening obstacles – there are the Shee, who will never stop trying to take the manor, and whose queen is obsessed with Venn. There is Sarah’s pursuer, a powerful, frightening Replicant and his wolf. And there is the mysterious, scarred man, who will stop at nothing to get back his stolen property back, once and for all. At the heart of all these tangled relationships, lies, and pursuits is the Chronoptika – an obsidian mirror, and a powerful artifact that has the ability to open holes in time itself. 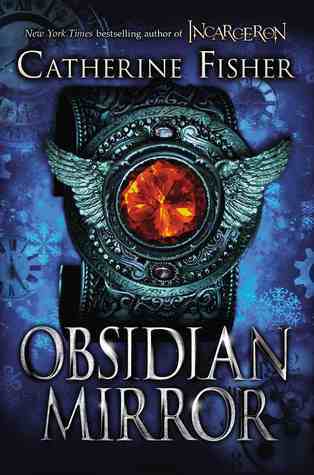 The first book in a new series, The Obsidian Mirror is another trademark Catherine Fisher work that blends science fiction and fantasy. Unfortunately, unlike the Incarceron duology or the Relic Master books, The Obsidian Mirror does not quite manage to blend these two subgenres convincingly, and suffers under the weight of its own excesses. Ultimately, the problems with The Obsidian Mirror can be boiled down to three core issues: there are too many disparate threads to the novel, there isn’t enough time spent developing the (many) different characters, and the novel is both confusing and strangely paced. The Shee – that is, the fey, who control the Wood outside of Venn’s home. The Shee include a Queen named Summer, her many cruel-hearted and beautiful followers, and a particularly meddlesome changeling. Needless to say, there is a LOT going on in The Obsidian Mirror, and a basic, vital rule of SFF is broken (repeatedly) by Fisher in this book: suspension of disbelief is impossible, because there is far too much going on. Any of these factors taken alone – or even a handful of these in combination – would make fodder for a fascinating blend of genres and tropes. All of them together at once is confusing and unsuccessful – but more than that, the dizzying combination leads, inevitably, to unresolved threads. Why, for example, were the Shee involved in this story at all? Exacerbating the clumsy worldbuilding is the strangely slow-moving plot. While The Obsidian Mirror starts off with a bang (actually, a clash of stage swords and some blood, to boot) and the core premise behind the book is strong, the plot is actually incredibly stilted. We don’t even see the titled mirror until about 200 pages into the book, at which point the story kinda-sorta decides to kick it up into second gear. Before this, there are plenty of coldly menacing Looks, a lot of sneaking around, stealing and reading secret journals (interrupted frequently by more menacing Looks), and so on and so forth. Also compounding The Obsidian Mirror‘s problems is the writing, which is simultaneously awkwardly jerky and melodramatic. And, unfortunately again, the latter trait also describes the main characters in the text. Jake is narcissistically self-righteous and stubborn, characterized solely by his Uncontrollable Anger and grim, repeated pronouncements that he will make. Venn. PAY. (This is to say nothing of Jake’s incredible leaps of logic coming to the conclusion that Venn killed his father) Venn is defined by his coldness and single-minded dedication to save his wife Leah; schoolmaster Wharton is defined by his exasperated with Jake; Sarah, perhaps the most rounded of the bunch, gets little time actually devoted to her character and mission, as she’s constantly fidgeting/hiding, on the run from those forces hot in her pursuit. All that is to say, there is no real connection with these characters, who feel more like caricatures, because there is so much jumping around and so many moving parts to the cumbersome story. While there are some compelling bits to The Obsidian Mirror – I enjoyed the premise of the book, at least (and, once the story finally kicks into action by the last 80 pages or so when the actual time travel finally happens) – there are too many issues with the writing, characters, and plot to truly recommend it. Sadly, this newest Fisher book is a miss for me, and I don’t think I’ll be back for more. The boy put on the mask outside the door. It was a heavy black fencing mask and inside its mesh he felt different. It mad him dark, supple, dangerous. He was wearing the costume for Hamlet, Act 5, the duel with Laertes, and he had the fencing sword ready in his hand. He had to be very careful. This could all go badly wrong, and not just in the way he wanted. He took a deep breath, and peered in through the glass panel. The rehearsal seemed to have paused; people were sitting around and Mr. Wharton was explaining something, waving an arm expressively to Mark Patten who was playing Laertes. Oh darn, the blurb had me interested, but I really dislike it when something with such a nice premise has clumsy worldbuilding. 🙁 I don’t think I’ll pick this up soon. Thanks for the informative review! Oh, oh. Well I’ve been warned but, on the basis of my love of Incarceron and Sapphique, I think I’m still going to give it a try. Of concern: there are a lot of plot elements for one book. While there will ultimately be more books in the series, it sounds like everything was thrown into this first one. Also, Jack sounds kind of like a jerk. Now is he supposed to be one or are we supposed to like and sympathize with him? Concerns aside, there are enough elements (which isn’t hard given how many there are apparently) that interest me, so I’ll keep my name on the library’s hold list for this book. That’s disappointing, considering how excellent INCARCERON is. You made me laugh though with “coldly menacing Looks” and “Jack is narcissistically self-righteous and stubborn, characterized solely by his Uncontrollable Anger and grim, repeated pronouncements that he will make. Venn. PAY.” I’ll probably follow Eliza’s plan and get this from the library just to glance at it, at least. I also found The Obsidian incredibly confusing, to the point where I struggled to identify what the book’s problems were. I’m hoping that it’ll become less confusing as the series progresses, so I’ll probably read the next book at least. But I agree, it’s not her best. Ana – I hear ya. This one has such a great sounding premise, but unfortunately it just failed to deliver. I found my mind wandering the whole time I was trying to read this one. Eliza – Completely understand – I wholeheartedly loved INCARCERON and SAPPHIQUE so much, too! I’d be interested to see your take on this one 🙂 The characters in this book are all the type of flawed that are supposed to win you over by the end (and to some extent they do change as you learn more about them…). Herenya – Good grief, you’re right. FIXED! Totally my fault but…again maybe speaks to how disconnected one feels from the characters? Sigh. I hope the books become more focused and less confusing as the series goes on – I’ll be on the lookout to see if book 2 shapes up to be better than this first effort! Well, I liked this a lot better than you did, although I can’t disagree with any of your criticisms. However, I think that with Fisher the whole “toss in everything including the hyperdimensional kitchen sink”, the clash of disparate genres playing off each other, and that sense of being unsure exactly what is going on are pretty much features, not bugs. Besides, I loved the way that the smallest details — e.g. character names (and who is referred to by first name and who isn’t), small architectural flourishes, dates and times and weather conditions, etc. — are invested with great significance and multiple resonances. But yeah, it’s a story that demands a lot of the reader, without delivering (in this initial volume) much of a payoff. I guess I’m putting enormous trust in the author to eventually repay my investment. (Also, I did like Jake, but I’ve got a sullen teenage boy of my own, so I’m biased). Oh no, I’m really excited for this book because it sounded like so much fun, and I’ve heard great things about Fisher. I will definitely give this one a try, but it is disappointing to hear that there is so much to this one story. Hopefully the rest of the series picks up!